Free download KMPlayer latest version from direct download link. K-Multimedia Player (commonly known as The KMPlayer, KMPlayer or KMP) is a media player for Windows which can play a large number of formats including VCD, DVD, AVI, MKV, Ogg, OGM, 3GP, MPEG-1/2/4, WMV, RealMedia, FLV and QuickTime. It has a significant user base and has received strong ratings and reviews on major independent download sites. The player handles a wide range of audio, video and subtitles formats and allows one to capture audio, video, and screenshots. It provides both internal and external filters with a fully controlled environment in terms of connections to other splitters, decoders, audio/video transform filters and renderers without grappling with the DirectShow merit system (a system of selecting and prioritizing codecs across the entire Windows operating system). Internal filters are not registered into the system’s registry to prevent the operating system from confusing system filters with K-Multimedia Player’s filters. 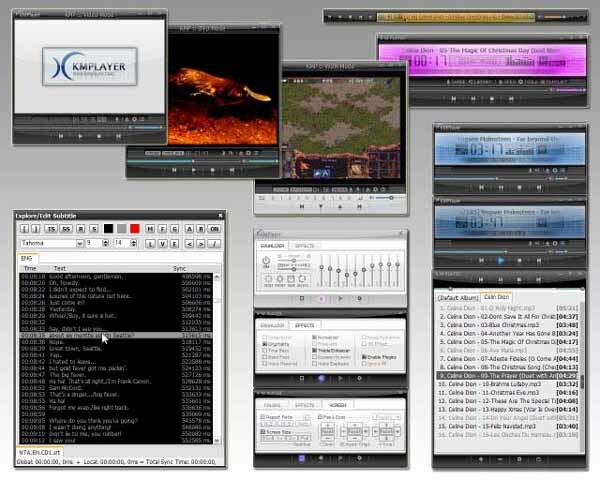 The player can set many audio and video effects, slow down or increase playback speed, select parts of a video as favorites, do various A-B repeats, remap the keys of remote interface for HTPC including overlay screen controls, and change a skin dynamically depending on a media type playing. KMP is completely customizable thanks to a wide selection of skins and color schemes, as well extensive the configuration options. KMPlayer is available free to download for your computer. It is the best player according to me because of its simple and easy user interface and great features.